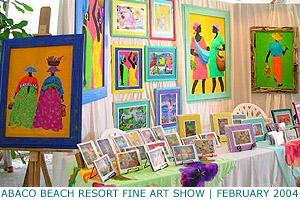 Artist Marjolein Scott-van der Hek lives and produces her spectacular artwork on the Island of Abaco in the Bahamas. Her paintings reflect the vibrant colours of a tropical paradise. Marjolein’s medium of choice is watercolour on silk, using oriental and western techniques based on the Indonesian art of Batik. The richness and depth of her colours are a result of a scintillating palette of special European silk paints and dyes that are layered onto each painting. The beautiful frames complementing her paintings are custom made by her Australian husband, from solid recycled wood, originally salvaged from local island homes destroyed by hurricanes that frequent the island. The Barefoot Contessas' Card Company produces limited edition giclee prints, framed and/or matted prints, and postcards of Marjolein’s work.